a book chick: "Gaudy Night"
my take: Written in 1936, instead of being historical fiction it's, um, period literature, I guess. Which is rather refreshing. In 1936 there'd been no WWII. It's almost like a Downton Abbey episode except that one doesn't need historians to make it accurate. Refreshing! That said, it was a bit tedious and I either did not pick up very subtle clues or there weren't clues to gather to solve the mystery. 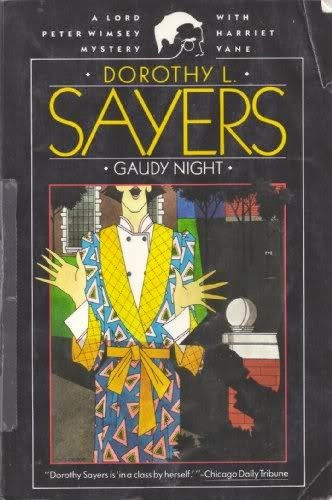 And, the love story between the main character, Harriet, and the Lord Peter Wimsey (whom I gather has a series of Ms. Sayers) was so veiled at the end that I wasn't able to figure out if they get together or not! Interesting characters, the lost innocent world of England pre-WWII, and a look at the roll of women in upper education made it worth a read for me. my source: Mother's toss pile - that said, Mother and I have more books than we can house and occasionally need to make space. And, we keep ones with which we absolutely can not part. And, a free book is a free book.